I love this lightened up version of potato salad. I use organic Yukon Gold potatoes as they are creamy and moist, and don’t require a lot of dressing and/or liquid like potato salad usually does. Since I gave up eggs (mayonnaise), this is my go-to recipe! It is light, lemony, and delicious! It’s one of those dishes I can’t stop eating. And, I can use herbs from my garden! Potatoes are a huge source of L-Lysine, an amino acid that goes to battle with the Epstein Barr Virus (EBV) so I eat a lot of potatoes. And I have gotten into the habit of steaming them as it’s fast, and it adds moisture to the potato itself. We all tend to need all the help we can get in our efforts to be well-hydrated. 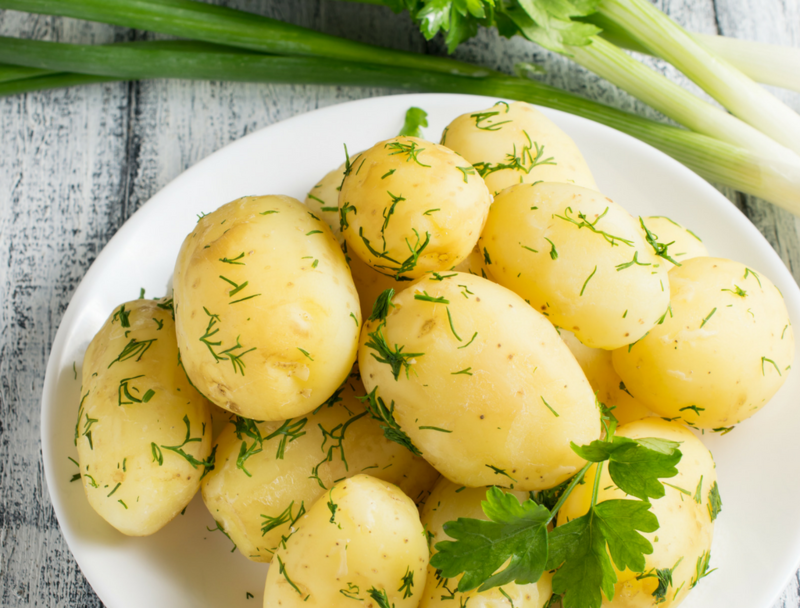 Leave the skin on your potatoes for added fiber and nutrition! I do. But my photography skills sometimes leave much to be desired so I’m using this photo sans skins. I also mix it up and make rainbow potato salad, throwing in some steamed sweet potatoes as well! And if you see the purple looking sweet potatoes, you’ve really got a rainbow! TIP: Food scientists are starting to genetically modify potatoes, so add them to the list of foods you buy organic. 1/4 cup fresh parsley, finely chopped. Stems are fine! 1/4 cup fresh cilantro, finely chopped. Stems are fine! Optional – if you want your potato salad to be extra medicinal, steam some onion with your potatoes. 1. Steam whole potatoes until fork tender (~30 mins). Then set them aside to cool. Peeling is optional, especially if you bought organic! 2. Once cool, dice the potatoes into quarters and place in a large serving bowl. 3. Add all ingredients with the potatoes and toss to combine. Consider doubling or tripling the recipe, since you and your loved ones are going to LOVE it!